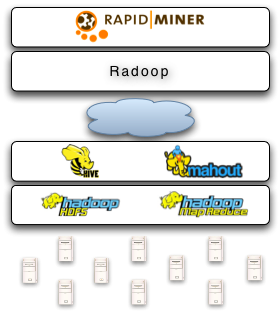 Those of you who visited RCOMM 2011 already know about Radoop , the powerful combination of RapidMiner with Hadoop. This make big data analytics easier then ever. I missed the talk myself (shame on me!) but we had a lot of fruitful discussions afterwards and from my point of view this will become the next RapidMiner revolution. Below you will find some information about the project. Hadoop is is a software framework that supports data-intensive distributed applications. It is based on Google now well-known map & reduce paradigm which makes it an excellent tool for analyzing large data sets. In principle, Hadoop is able to work with thousands of computing nodes on petabytes of data. Right now, a restricted beta phase has started and you can apply for it at http://radoop.eu/ . More information about Radoop can be found at http://blog.radoop.eu/.